Note: Do not use hot glue or cool melt glue with fresh flowers. That type of glue can damage flowers and pops off easily when flowers are refrigerated. Floral glue stays adhered regardless of moisture or refrigeration. 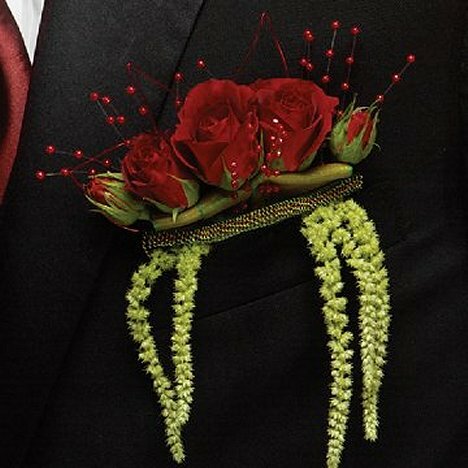 A new idea is the pocket boutonniere. 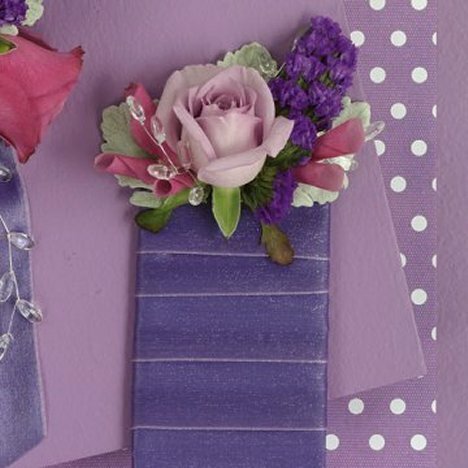 Using floral adhesive to glue a line of fresh flowers, ribbons and filler across the top of a cardboard cut to the size of the breast pocket of a tux or suit. 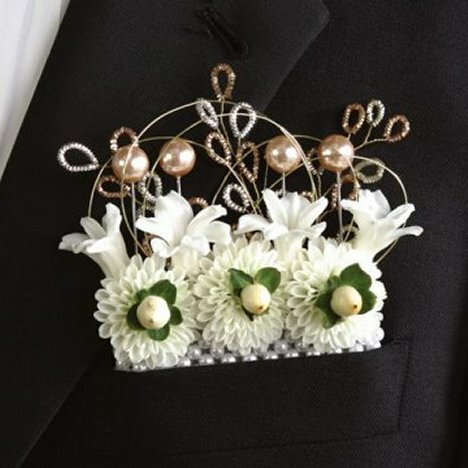 Decorate to suit you, then simply tuck the finished flowers into the pocket! If you wish, finish the piece of cardboard off with a wrap of matching ribbon. Check out the bottom of a quick tutorial on creating your own pocket squares. Decorate with wire, bling, rhinestones, a cluster of flowers or a row of the same flower head - it's fun to design! Here's an unusual way - gluing petals (using floral adhesive) instead of the flower head. 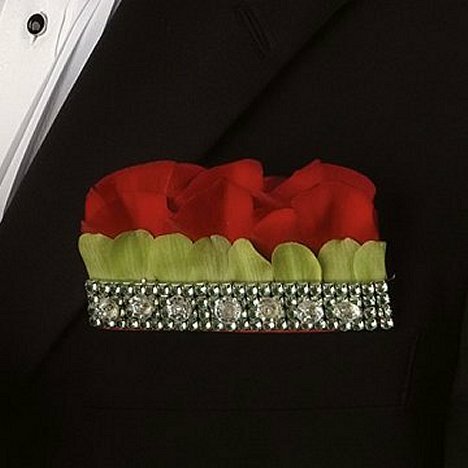 Add an attractive band of ribbon or rhinestones to finish. 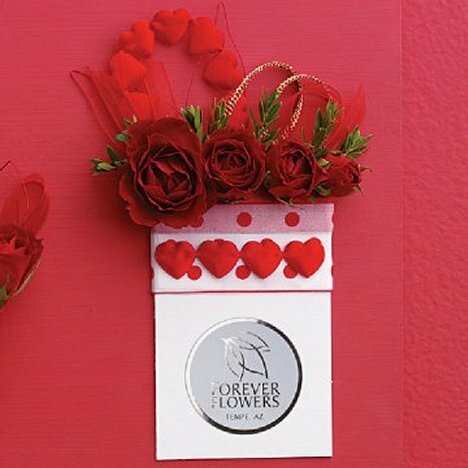 Here, a few sprays of looped pearls and a couple pieces of hanging amaranthus finish off red roses beautifully. 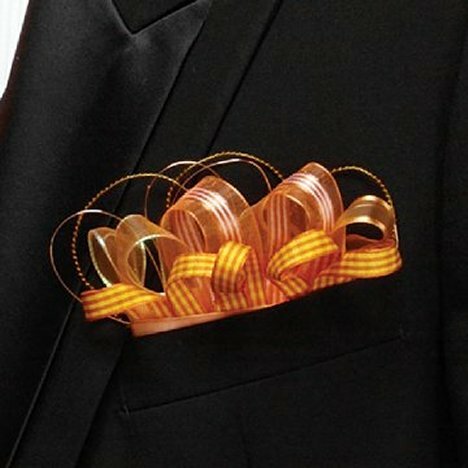 Even just loops of ribbon can be used to peek coyly out of the top of the pocket! This card can be finished off with a store logo, your stamp, or a photo of that "special girl"!